Davis science fiction writer Kim Stanley Robinson has swept the awards for his Mars trilogy and here's a safe prediction: His next novel, "Antarctica," will be an award-winner, too. 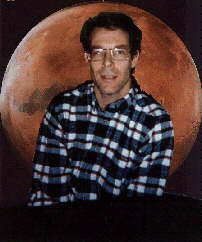 Robinson published "Red Mars" in 1993, which won the Nebula Award. "Green Mars," published in 1994, won the Hugo Award and "Blue Mars," published in 1996, won the Hugo in September for the best science fiction novel of the year. The trilogy describes the human habitation of Mars and the terraformation of Mars to support human life - a complicated evolution involving engineering, politics and biological sciences that Robinson follows for 200 years in 1,600 pages. He says the books in the trilogy are selling well, mainly through word of mouth. Robinson's work also got a big boost this summer when Pathfinder landed on Mars. He was invited down to the Jet Propulsion Lab in Pasadena to be part of the party over the Fourth of July weekend. "Mars was big news for the first time in many years," he said. "And I was there really as a media spokesperson for Mars, a generalist among scientists. But NASA went out on a limb inviting me down," he added. "It would have been a strange event if Pathfinder had crashed and burned." Someday, Robinson will have to leave Mars behind, but not quite yet. His next Mars book will be "A Martian Romance," which will go to the publisher this spring. "Romance" will be a collection of short stories, involving some of the same characters found in the trilogy. It also may include landscape poetry about Mars. "I noticed rereading the Mars books, which I'd never done before, that there are a lot of opportunities for interweaving short stories that will describe interesting moments along the way that the novel itself didn't talk about," Robinson said. "This is my final work on Mars but in the years ahead if I have an idea for a short story I could write it and jam it into that collection in a subsequent edition. I don't want to leave Mars, that's why I'm doing this companion book." Robinson hasn't decided whether he will include poetry in "Romance." But for the past two spring quarters he's been able to practice by sitting in on poet Gary Snyder's workshops. "He's a tremendous teacher and a wonderful poet," said Robinson. "I love to read poems, often it's the last thing I do at night. It means a lot to me as a literary person. But that doesn't mean that I can write them." Before "A Martian Romance" is released, readers will have the opportunity to see what Robinson describes as a natural progression to his Mars trilogy and this is "Antarctica," a future history about the terraforming of the South Pole. There's just one hitch: Already released in Britain, "Antarctica" won't be out in the United States until July of 1998. But it's worth waiting for. Robinson went to Antarctica in 1995 for six weeks, courtesy of the National Science Foundation. "It's the part of Earth most like Mars and people who study Mars go down to the dry valleys of Antarctica to investigate what the landscape is like as the best analog to studying Mars directly. I spent six weeks as sort of a roving reporter, going where opportunity took me." He says science fiction is the perfect genre to talk about Antarctica. "It's going to be more interesting there in the next 100 years ago than it has in the last 100 years simply because we are developing more and more technologies to get down there and survive and operate. And there is oil beneath the ice representing trillions of dollars. You can see this slow-motion train wreck coming in the next century." The competing forces represent those who want to extract oil and those who want to turn the icy land into a world wilderness park. "These two forces are both very intent on their programs and very intense and are headed for a collision. My novel is the story of that collision," he said. Other forces that sometimes clash are scientists and workers. "Since 1959, Antarctica has existed as kind of a peculiar international scientific utopian project with very few people involved," he said. The workers run the restaurants, living quarters, and provide transportation and supplies for five or six months at a time and then go home - or to some warm tropical paradise - before returning to the ice and snow. "The scientific work being done and this unusual social situation are really what Antarctica's about," he said. Added to this is a new group of adventurers. "Since 1986 people have been going down there to reproduce the early expeditions just to see what happened to those early explorers. I did not try that but I went out to scientific field camps where scientists are living in a manner similar to the early explorers except they are staying in one spot and are being serviced by helicopters from base camps." Robinson says the purity and beauty of Antarctica is addictive. "I'd love to go back and if I were young and single I would," he said. the author of "Red Mars,"
"Green Mars" and "Blue Mars." His newly published novel is "Antarctica"
"Next stop for Mars junkies? the November 2, 1997, PRINTED MATTER column.